Editorial and book design is a discipline we very much enjoy working in, particularly because it embodies every designer’s passion for printed matters and tactile quality. Book design is after all one of the earliest form of graphic design as we define it today; and has become nowadays a refreshing traditional design medium in an increasingly digital world. 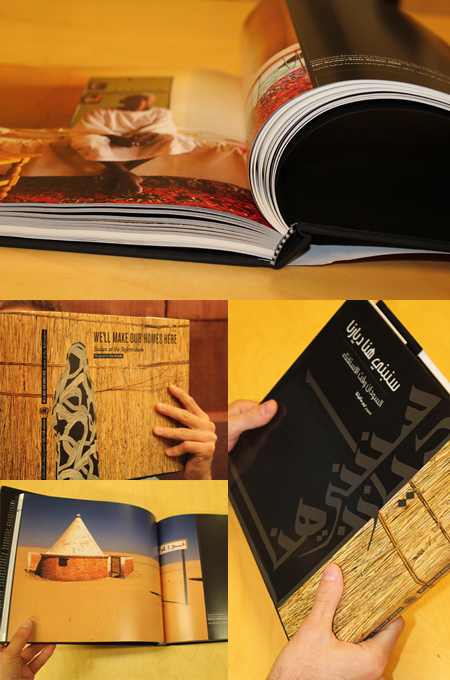 Earlier this year we had the opportunity to work on an appealing book design project: “We’ll make our homes here: Sudan at the Referendum”- published by the United Nations Mission in Sudan and joining Tim McKulka’s formidable photographs with reflections on Sudanese identity from various Sudanese writers. The project was of great interest to us at Tarek Atrissi Design: on one hand it touched on a timely political subject, the declaration of the independence of southern Sudan, and the socio-cultural implications that lead to and will eventually result from this change. On the other hand, this was a bilingual book design project, in Arabic and English, bringing with it the typical challenges that we face in any of our multilingual design projects. 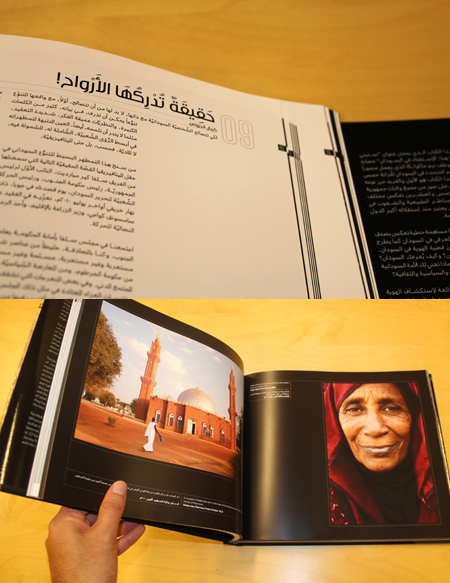 “We’ll Make Our Homes Here” is the first book to include photography from all 25 Sudanese states. It is also the last book to do so after the conclusion of a conflict that spanned five decades with the birth of a new nation: The Republic of South Sudan. McKulka’s photographs show Sudan in all its topographical and human variety: very diverse natural landscapes (from deserts to mountains all the way to the capital of Khartoum) together with a varied mix of ethnicities (Nomads, Arab traders and Tribal groups). This book about Sudan, the largest country in Africa, is a capture through the eyes and words of Sudanese people who witnessed their country’s transformation as it happened. The book’s 13 essays – addressing everything from political analysis and journalism to fiction and poetry – are mostly very personal, and some nostalgic, remembering the cosmopolitan Khartoum of the 1960s, or reflecting on the notion and meaning of the Sudanese identity. From a design point of view, the book was an exciting challenge. It was certainly not difficult to showcase the incredibly rich photography of the New York based photographer Tim McKulka. As a matter of fact, we aimed to keep the layout of the book as minimal as possible in order to let the rich photography speaks for itself and to have it as the highest hierarchy of the book’s structural elements (grid, typography and imagery). The main design challenges were of course resulting from the bilingual nature of the book: establishing a navigational system through the publication that works in presenting the different levels of content regardless of the choice of reading language. The book has two distinct, yet somehow similarly structured sections: an Arabic right to left book side and another Latin left to right side – each containing the essays in the respective language. The photographs in each section where however different, and the bilingual system adopted to the captions carries the readers across the entire book regardless of their choice of reading language. 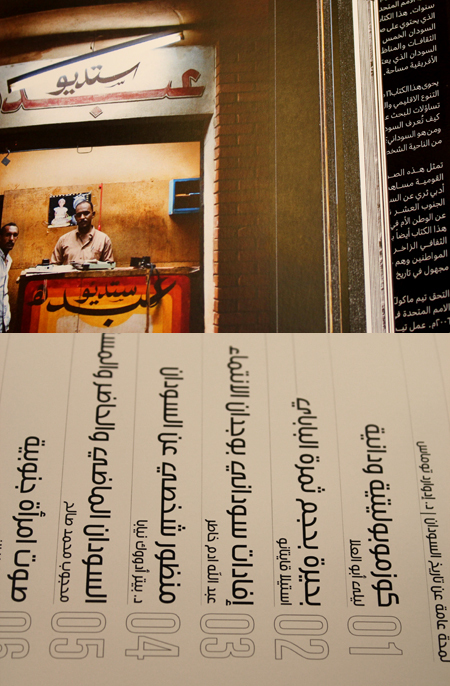 The typographic decisions were made with the goal of creating harmony and balance between the Arabic and English pages. Title and text fonts were chosen in order to fit the large format of the book and facilitate the reading experience by fitting well within the chosen page and layout proportions. “We’ll make our homes here” is published in a limited print run. The next step of the project will be publishing the book digitally in the form of an iPad application: a similar bilingual challenge in a totally different and rather new medium. A step we are very excited about, as it combines our passions for interface design and reaching audience across cultures.